Sault Ste. Marie product Camaryn Baber is fresh from his most productive weekend in his young Ontario Hockey League career. The 2001 birth-year center had a pair of one-goal, one-assist games to spark the Saginaw Spirit to a sweep of the Flint Firebirds. In all, Baber figured in on four of Saginaw’s nine goals as the Spirit scored narrow 4-2 and 5-4 victories over its Interstate 75 highway rivals from Flint. To be sure, Baber is taking advantage of an opportunity for regular playing duty after being Saginaw’s 13th forward for much of the 2018-2019 season. Not only does the rookie pivot have two goals, two assists, four points in his last two games but he has tallied three times in his past five outings for the Spirit. All together, the 5-foot-11, 180-pound Baber has played in 30 of Saginaw’s 50 games thus far this season and has five goals, six assists, 11 points. Those who know Baber from watching him play in Sault Ste. Marie over the years are not likely surprised that the hustling forward with the relentless work ethic and rocket for a shot is making the most of more ice time in Saginaw. As a 16-year old rookie playing for the Soo Thunderbirds against 19 and 20 year old players in the tough Northern Ontario Jr. Hockey League in 2017-2018, Baber produced 15 goals, 31 assists, 46 points in 46 games and racked up 67 minutes in penalties. He was arguably the Thunderbirds best all-around player as a 16-year old and was a catalyst who played with speed, energy and a sandpaper edge for his hometown NOJHL team. To be sure, Baber is showing signs of being a shrewd pick by Saginaw general manager Dave Drinkill, who took the fibrous forward in the third round, 57th overall, at the 2017 OHL priority selections draft. Drinkill got to see plenty of what Baber had to offer during the 2016-2017 season with the Soo Major Thunderbirds of the Great North Midget Hockey League. As a minor midget, Baber was the best player on the Soo major midgets and earned a spot with Team Northern Ontario Hockey Association (NOHA) at the OHL Cup tournament. Baber got his first taste of the OHL in 2017-2018 when Saginaw called him up from the NOJHL for 11 games. Baber scored one goal, two assists, three points for Saginaw last season before finishing up back home in the Soo and the NOJHL. This season, with Saginaw a serious contender in the 10-team Western Conference, Baber has had to bide his team and wait for his chance to move up in the lineup on a Spirit squad that is deep in veteran forwards. Besides being a healthy scratch numerous times as the 13th forward, Baber missed a number of games with a concussion injury. Now, with a collarbone injury having sidelined veteran forward Danny Katic, Baber has moved up on to one of Saginaw’s four lines. And those four points in two games this past weekend look to be an indicator of what Baber has to offer and what he is capable of doing at the OHL level. Those who pick the three stars certainly took note of Baber in both of his one-goal, one-assist outings. Baber earned the game’s first star in the 4-2 win over Flint and was chosen as the second star in the 5-4 victory over the Firebirds. Baber is one of two Sault Ste. Marie products playing for Saginaw. The other is second-year winger Nick Porco, who like Baber, has a 2001 birth date. The 6-foot, 170-pound Porco, who has separation speed that few in the OHL possess, has 18 goals, 10 assists, 28 points in 49 games for Saginaw this season. 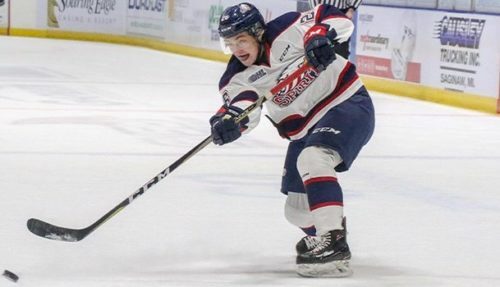 Porco, who was Saginaw’s first-round pick, fourth overall, at the 2017 OHL priority selections draft, is listed as a prospect for the 2019 National Hockey League draft on its mid term, Central Scouting rankings. As a team, Saginaw sits in third place in the Western Conference standings and takes a record of 32-14-4, good for 68 points, into play this week.